Two Bears Farm and the Three Cubs: Dirt Farmers. Or Not. This year will be 'attempt to have a garden' effort ten. We are really trying to do it right this year. We will not let weeds overtake everything this time, oh no! We're really going to grow stuff! We have a new spot we're trying out, the site of an old barn that we just tore down. 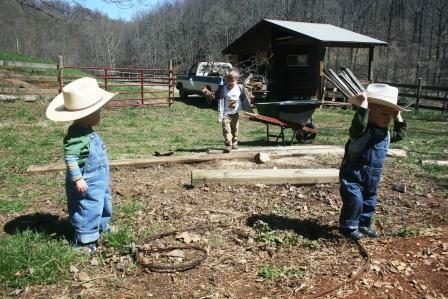 I thought it would be cute to take a pic of the twins in the wheelbarrow, but Reid didn't find this amusing at all. Wish us luck! Next up will be digging out more rock, tilling and rows, and then putting up a fence to keep out the deer and chickens. Then, assuming we make it that far, we'll be planting! Babies often don't appreciate a good photo op! Actually my "baby" is 3 and he still gets ornery sometimes when the camera comes out. 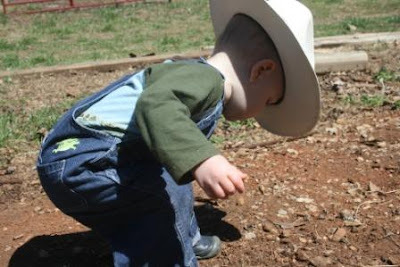 I remember well all those days of rock picking in horse paddocks. Cute pics!! your boys are adorable to say the least. Love the photos! I'm looking forward to seeing your garden. We began ours 3 years ago - I couldn't believe that things actually grew! I'd never kept a plant alive in my life up until then, but previous 'greens' had always been indoor plants which I had to water.....and duly forgot every time! Outdoors, God waters them (well, here in Scotland it happens that way - maybe you'll have to water them yourselves!). You will love it. The bug has totally bitten me, and I'm posting today about some of my seedlings which are popping indoors, and will be planted outside in a few weeks. 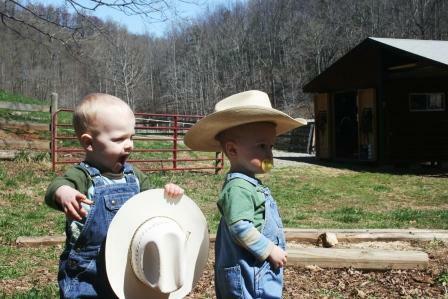 Okay, so the pics of the twins in their cowboy hats is officially my favorite of them. How did you manage to keep them on their heads during the "photo shoot?" Awesome pics and good luck! Your boys are too cute. 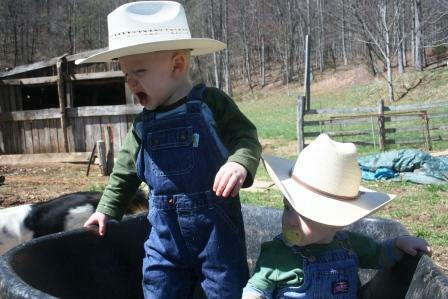 I love the cowboy hats and overalls. I can't wait to see how your garden turns out. 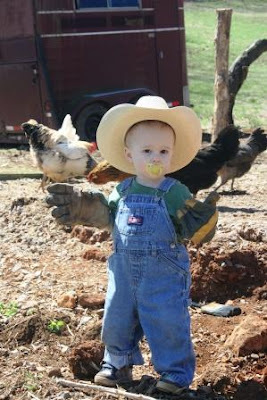 those are some adorable farmer boys! good luck with the garden! yikes! Success is only one hill of beans away. I hope you get to eat the fruits of your labor. That is if the deer and chickens don't beat you to it. LOL! Good luck. Oh I forgot to say you have an experienced group of farm hands. LOL !!! My mom and I have a garden every year. Last year she was talking how her parents never watered their garden once it was planted and it grew like mad.. I wonder if it would make a difference if we didn't water it like we did last year and make less weeds for us.. The weeds drive me batty. The boys looks so cute with hats on. I bet the loved the dirt. 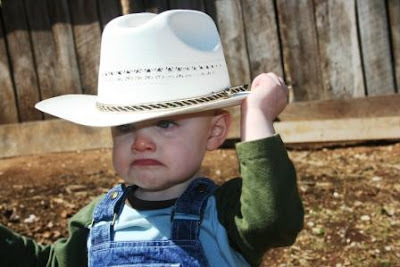 It's the cowboy hats that slay me--the utter cuteness! And the mad face about the wheelbarrow fiasco! Lisa! You boys are just adorable. I love the overalls and cowboy hats...so darn cute. Good luck with your garden. Your boys are so stinking cute! That's going to be a heck of a garden out there. With all your adorable helpers, you will have the best garden ever, I think! Awesome - we are working on getting things started with our garden too. I need to post up some pictures. We had some surprise winter survivals. I hope that the babies will be as helpful as Buddha Bear has been. He loves to "grow them" with water - unfortunately I don't know how much my mango seedling likes that lol. Oh my goodness! LOVE the grudge photo... adorably fun shots! 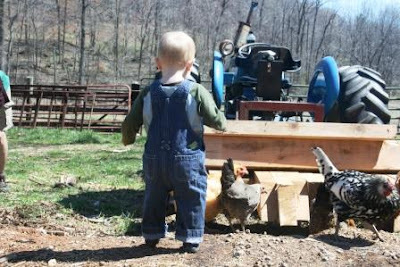 Great shots of your little farmers! Thank you for visiting my blog today. 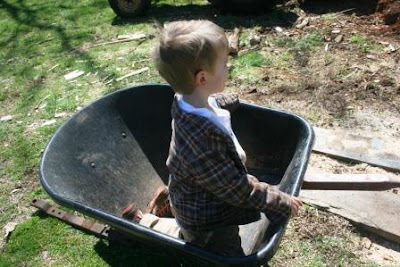 That pic of Reid pouting after the wheelbarrow incident is too cute! so cute. 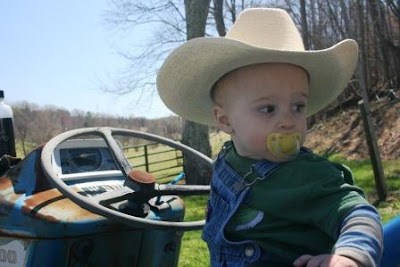 love the cowboy pacifiers! we are right there with ya.. have you checked out mother earths news garden planner, going to work on mine tonight. we are too late to plant for spring in AZ but my next season will be July, can't wait to see how it goes for you. Good luck, that is awesome! Gardens are so wonderful! I can't seem to ever really keep much alive but I sure do love raiding my sister's garden LOL. Ok so your boys.... HOW STINKIN CUTE ARE THEY!!! The overalls... ohhh I am swooning over them. Oh & that picture of Reid pouting... that my friend is frame worthy! Such cute kids! I love watching my kids play outdoors... sheer happiness! That little farmer's expression says it all! Such a funny photo. Have a good weekend! ohhh i love those boys and their hats!!! Can I just tell you how adorable the boys are - and glad he finally forgave you! Good luck with the garden...sounds like a great plan to me. With adorable helpers like that how can your garden possibly fail? Looks like you're off to a great start with the garden. Very cute helpers!